Stay centrally at Solli Plass on the west side of Oslo. The area offers a lively nightlife. Attractions such as Aker Brygge, Tjuvholmen and the Royal Palace are all within walking distance. Enjoy our “planks” with Nordic snacks at V Solli Bar & Spiseri. We also have great conference facilities. Enjoy a lovely lunch or dinner, or check out our exciting food concept, Nordic Bites, in our restaurant V Solli Bar & Spiseri. Ask for one of our popular rooms with a balcony, and enjoy the views over Oslofjord! After a long day of shopping or meetings, you can have a workout in our fully equipped gym before relaxing in the sauna. As always at Scandic, we have free WiFi throughout the hotel. We have great conference facilities: 11 meeting rooms, a capacity for up to 250 people, and we can adapt everything according to your wishes and needs. Scandic Solli has a perfect location at Solli Plass on the west side of Oslo. It is easy to move around the city from the hotel and visit Oslo attractions such as Akershus Fortress, Slottet, Astrup Fearnley museum at Tjuvholmen and shopping at Aker Brygge. Only 300 metres away, you will find Vika Terrasse with great shopping, for instance House of Oslo with interior and design shops. At Solli plass you will find excellent bus and tram connections. From the hotel, you are only a 5-minute walk from Nationaltheatret station and the airport express train, Flytoget, taking you directly to Oslo Lufthavn Gardermoen in about 20 minutes. Try our new food concept, Nordic Bites, at this Oslo restaurant and watch the world go by through the large windows at the Scandic Solli hotel. 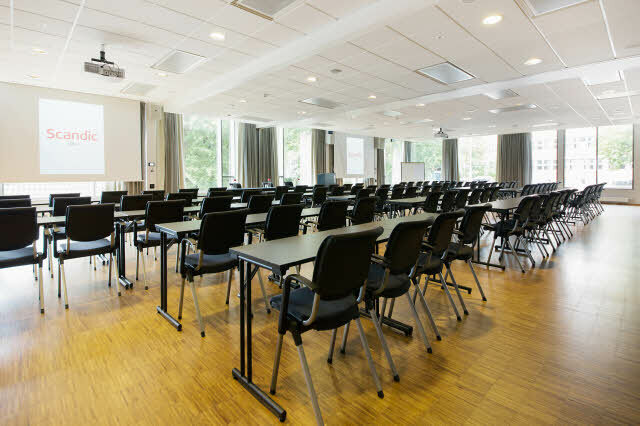 Scandic Solli organises conferences for up to 250 people. We have 11 different conference rooms with modern meeting technology. All the meeting rooms have free wireless Internet access.